You’d have to have been living under a rock to have missed the furore over the killing of Cecil, the Zimbabwean lion last week. In case you were, here are the details: For the sum of $50,000 (about R633,000) Cecil, the much loved Zimbabwean lion, was lured out of his protected habitat, shot with a bow and arrow, hunted for 40 hours and then killed with a gun by a “trophy hunter” with deep pockets who likes to mount large, dead things on his wall. Walter Palmer, the man behind the gun, has gone into hiding in the wake of the uproar and donations have been flooding in for the Oxford University conservation project that Cecil was part of. But in an editorial, The Guardian newspaper points out one of the problems with the global outrage. 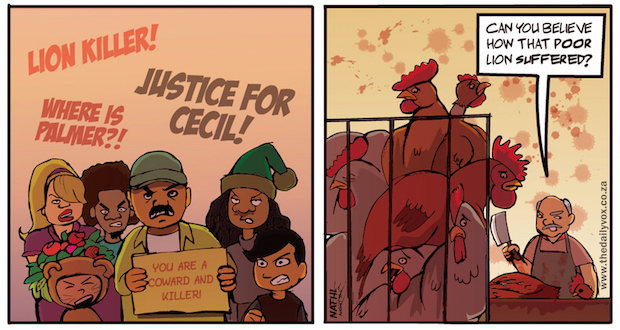 Cecilâ€™s free-range existence was circumscribed by the limitations of the park â€“ about 14,650 sq km. The average factory chicken is afforded the living space roughly equivalent to a piece of A4 paper. And they live for about six weeks, in vast filthy sheds full of their own excrement, and without any experience of sun or fresh air. “So is the Cecil furore just a bit of western sentimentality from those who can hum The Circle of Life, but who have no real appreciation of what it means?” they ask. Meanwhile, Salon magazine pointed out that while we were all tweeting about Cecil, one of the worldâ€™s five remaining northern white rhinos died, five endangered elephants were killed poached, and environmental groups warned that global population of tigers is at an all-time low. If we feel strongly about the ethical treatment of animals, we shouldn’t let our anger die down as soon as the news around Cecil and Palmer does.